KCVI is Ontario's oldest secondary school, founded in 1785. The School Board plans to close it within the next five years. 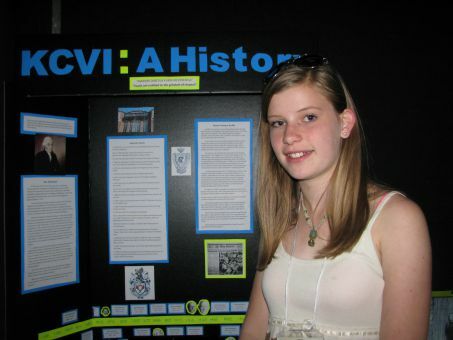 My video explores KCVI’s history and its value to the people of Kingston with interviews, images, and engaging facts. I have learned that high schools play an extremely important role in society and community. People have worked very hard to stop the closure of KCVI. Their work has been emotionally challenging and shows how much this school means to the people of Kingston. KCVI has changed names and locations over five times, yet it is still considered to be the same school that started over 200 years ago. In a way, KCVI's history might continue after it closes, if many of the faculty and students end up together in a new school. This situation is not completely different from ones in the past. My project covers a period of over 200 years. However, up until 1925, families had to pay for their children to attend high school. Luckily, attending high school until you are 16 is now mandatory, and students don't have to pay. This is an amazing step up in the history of education, and puts more wealthy families at less of an advantage.